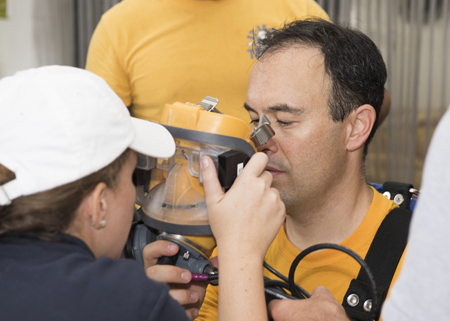 Naval Surface Warfare Center Panama City Division’s Diver Augmented Vision Display (DAVD) project team successfully surpassed all expectations at the first in-water testing Oct. 10-13, 2017. Sponsored by Naval Sea Systems Command Supervisor, Diving and Salvage (NAVSEA 00C), Panama City’s project team was elated to see how well the DAVD prototype performed in the intended environment. The DAVD is a binocular head-up display (HUD) that is mounted inside the Kirby Morgan 37 (KM-37) dive helmet and the MK-20 Full Face Mask (MK-20 FFM). The prototype uses commercial see-through lenses and custom 3D printed frame systems for the helmet and facemask versions. Dive supervisors relay high-resolution visual mission data to the HUD via an Ethernet cable married to the diver’s primary umbilical. Divers can clearly view text messages, video, photographs, instructions, and augmented reality images even in murky, zero visibility conditions. They can also see their real-time location during the dive mission via scanning sonar imagery, just like a virtual reality video game. “We learned a lot about how the system can be used effectively by our divers conducting real missions. Overall, our test objectives were met, and now were are focused on Phase three (III) development,” said DAVD Project Manager Dennis Gallagher. DAVD is one of NSWC Panama City’s most recent rapid prototyping and high-velocity learning initiatives. Total concept to test time has been less than two years. The DAVD project and tests were made possible by innovation and collaborative efforts between NSWC PCD and local commands. NSWC PCD welcomed Fleet divers and commanding officers from the Naval Experimental Diving Unit, Naval Diving and Salvage Training Center, and the Center for Explosive Ordnance and Diving to participate in the tests. Representatives from the National Aeronautics And Space Administration’s (NASA’s) Johnson Space Center were on hand to observe the DAVD tests, and are in discussions with NSWC PCD to explore a possible collaborative development for the next-generation Extra Vehicular Activity (EVA) space suit’s informatics head-up display capability.